Re the reports on bus crashes last week, specifically those caused by burst tyres, I would like to draw attention once again to my previous assertions that the manner of construction of barrier kerbs and dividing islands everywhere is a major cause of burst tyres. Tyre sidewalls are the Achilles heel of all motor vehicles. Tyre sidewalls must never be allowed to come in contact with hard objects. If any driver does'nt know that from his early days of driving, or from plain common sense, he should at least know it from the K53 course that comes with his driver's licence. The lucky case is when a kerb is struck and it cuts the tyre, so that the tyre has to be replaced, no questions asked, no option, just pay up for a new tyre. The worst case is when a kerb is struck and it does NOT cut the sidewall. In such a case the delicate fibres of the sidewall are weakened. No one, not even a road worthy inspector, or a cop at a road block, can see from the outside if there is such an injury in a sidewall, but that injury can cause a blowout on a long journey, when loaded, at high speed, and as heat builds up in the tyre. This is the most likely reason the tyres on these busses, and many other vehicles, have burst (blown out). The placement of barrier kerbs, and speed humps for that matter, is a form of traffic control that comes from the drill sergeant approach, "you will or else". Or else you will damage your car. This does not allow for all situations, least of all human error. Human error is a legally recognized and accepted form of human conduct. Planners cannot ignore the possibility of human error and should plan to minimise the effects there-of. If one looks at barrier kerbs and lane dividers etc everywhere one sees the black marks and the graunches in the concrete from the many wheel strikes they have received. This is an inditement of the planners who put those objects there, when they could just as well have put down painted lines to guide the traffic. This entire matter has been worsened by the maze of channels built at great unnecessary cost for the BRT busses that were needed to bring the crowds to the stadium for the World Cup soccer matches. See pic of channels in North End. While on the road we are surrounded by these hazardous threats that can strike at the Achilles heel at any time, inside our cars we are blissfully surrounded by a million safety features to protect us in case of an accident. Here is a case where two high level Authorities, cars and roads, have not been talking to each other. If the Minister of Transport is to do anything to reduce future accidents, the banning of aforesaid road hazards should be one of them. And where ever they exisit there should be a programme to start removing them. See pic of mountable divider on N2 at Wilderness. Re speed humps, if they must be employed, there should be active warnings, like rumble strips, ahead of them, not merely the passive sign boards which are often damaged, missing or defaced, or may simply not be noticed for any of a hundred reasons. See pic of speed hump concealed in a shaddow. We have seen the local municipality actually apologizing for rumble strips (Kragga Kama) and / or removing them in the few places where they were installed. This has been my pet subject for some time and since no one in control wants to listen, I have created a (free) website dealing with this and other road design issues which can be seen at www.septua.co.za Your readers are invited to visit that site and specifically to look for the pages "Silent cops or silent executioners", "Quo vadis BRT", and "Letters". I attach a photograph of a freshly graunched kerb on the new BRT in Harrower Road (above). Tyres are not made to withstand this type of treatment, and when such damage is on a kerb, there is a potential death accident in the making. 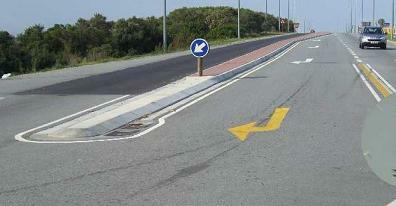 l am amazed how many sane thinking people actuallly believe speed humps can be placed in Target Kloof. One good thing about this ridiculous "traffic calming" device is that up to now there is at least a policy in place prohibiting their use on main arterial routes. The first speed hump was the brain child of someone to install a silent cop in a parking area where people were at risk of being knocked over. Later, as car use and pressure of time increased, they were used as silent cops in some quiet residential areas. Still later as live cops were absent, speed humps became a convenient law enforcement device, much easier than prosecuting offenders. There is an underlying speed hump principle that should anyone break the law, or simply not be attentive enough, he must damage his car. An ancient law enforcement device like chopping off the hand of a thief. But many people driving normally have damaged their cars on speed humps, which cannot be crossed even within the specified speed limit. The same applies to the plethora of traffic calming circles, which are now installed in combination with speed humps, as fast as the city can do it. Look at the many strike marks on speed humps, circle islands and kerbs, to see what I mean. Each one of those gouges into the concrete means a punishment was handed out to a possibly innocent person. Each strike mark also means one more unsafe vehicle with possible invisible tyre sidewall or undercarraige damage, that will in most cases just keep on driving. People who have done nothing wrong have been punished by having their vehicles damaged through an officially sanctioned booby trap in the road. The real downside is the many fatal accidents where tyres burst or drivers just loose control. So do we really want speed humps ? 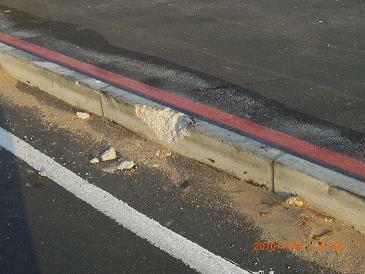 The use of noisy rumble strips in Target Kloof is a softer (no pun intended) approach to control speed. It is a more subtle reminder to drivers to watch their speed, slow down, hazard ahead. Much better than a small triangular warning sign as used for speed humps, that might not be seen. The choice of studs as a method can be argued about, I prefer the bitumen strips on the freeway ramps, but other than rattle the car a bit, they can definately not cause damage to a roadworthy vehicle, and they can not throw out wheel alignment. 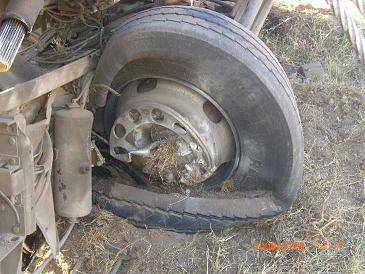 A SPATE of recent fatal road accidents has been caused by burst tyres. No one seems to put two and two together. Various aggressive road obstacles, ostensibly to control traffic, are frequently being struck by car wheels, causing internal damage to tyres that later are prone to burst. Tyres are highly sophisticated parts of our vehicles. They just don’t blow out by themselves. However, they are subject to many hazards not within the control of tyre and car manufacturers. Obviously these hazards include overloading and under-capacity tyres. I want to emphasise aggressive road features. Most dangerous to tyres are lane markers and the controversial traffic circles. For some reason that defies logic, most of these are built out of traditional square kerbstones. Lately there seems to be a proliferation of these control and “calming” elements. In their practical implementation they are also carelessly placed, interfering with natural curve and flow lines. Each time a wheel strikes one of these kerbstones, a tyre sidewall is potentially weakened, and another candidate for a road fatality is created. One only needs to look as you drive to see how many times these kerbstones and bull-nosed lane dividers have been struck by wheels. Draw your own conclusions as to how many vehicles out there have this unseen hazard of weakened sidewalls. I call these features aggressive, because they, along with speed humps, are part of a punitive system to punish alleged offenders for transgressing and not keeping their eyes open. However, just about everyone who has ever driven has stuck a kerb at one time or another, due to bad light, poor vision or blinding headlights. I lay shared responsibility for burst tyres at the feet of the authorities who set and implement road design specifications. At the same time I do not want to criticise any individuals for doing their jobs, they are following a long tradition of doing it the way it was always done, but there is an element of innocent ignorance. With ever increasing congestion, there is an urgent need for some new thinking in road design and planning. I would like to see a start with this issue and ban punitive road features that damage cars. Stop using these sharp kerbstones. All kerbs should be angled, there should be nothing in the roads that if struck by a wheel, could damage the sidewalls of a tyre. And let’s think up some way to retrofit angled kerbstones at all the high risk places. I HAVE previously pointed out (“Tyre damage on circle kerbs leads to blowouts”, The Herald, January 17) that certain road features in our metro’s road system, placed there ostensibly to regulate vehicle flow, and for “traffic calming” purposes, are causing damage to cars and tyres, and could indirectly be contributing to our horrific road death statistics. The authorities and the planners appear to be unaware of the hazards some of these features are creating and the extent of the damage they are causing. In addition there appears to be no effective maintenance programme to repair crucial warning signs. At present, the worst hazard must be Willow Road in Fairview. The road structure of Fairview has recently been upgraded in preparation for its impending resettlement. A large number of vehicles are daily travelling through this area, in search of short cuts around the congested adjacent routes of William Moffett and Circular Drive, taking advantage of these new roads. In the planning it was decided to place two little traffic circles in Willow Road. Thousands of cars daily have to slow to a dead crawl to negotiate these two little circles, which are effectively in the middle of nowhere, and serving no apparent purpose at present. Numerous vehicles have struck these circles and in some cases severe damage has occurred. The circle at the intersection of Willow and Frank Landman is the worst. Skid marks and crash marks are all over and the area looks like a war zone. The warning signs have been knocked down one by one over the past number of months and have not been replaced. The one street light nearby that would partially illuminate the circle is out of order. Under certain conditions at night the circle is invisible to the unsuspecting driver until the last moment, and then crash, bang. One morning recently the road beyond the circle was littered with pieces from a car, including fragments of aluminum casting from the gearbox, and oil was over a large area of the road. On another occasion a vehicle suffered a similar impact and trailed a long line of oil beyond the island. In the last few days another oil trail appeared near the circle. It is obvious that someone in the metro needs to venture out of his comfort zone and take care of the road hazards at that area. IN response to Pierre Joubert's letter ("Cars damaged on Willow Rd circles" , The Herald, April 20), I can only say you are meant to drive around circles, not over them! I have lived in Lorraine for a couple of years now and travel this road at least twice a day, usually during peak hour. I have not damaged my car on this road at all even though some drivers do not know how to approach a traffic circle or use It correctly. I try to be a responsible road user even when others are not. I have used the road at night and am aware that the lighting is not always the best, yet I have still managed to get my car and myself home in one piece. Blaming the traffic authori-ties and town planners is yet another example of how many people are prepared to blame others for something they should be taking responsibility for. The road hazards anre there for a reason, which is to slow traffic down, especially when it does become a residential area. JUDGING from the number of skid marks running over the two Willow Road traffic circles and the noticeable absence of many of the reflective arrow signs at these circles - which have been knocked over and not replaced - these Fairview circles appear to be more of a hindrance than a help to motorists. While driving to work last week, Lorraine resident Ashleigh Sanderson was involved in a collision with the car in front of her near the circle. According to Sanderson, a vehicle several cars ahead of her braked suddenly to avoid hitting the circle. "I turned down my radio and when I looked up everyone had braked." Nelson Mandela Bay Municipality spokesman, Lourens Schoeman, said: "The motorists who do not notice the signs are probably travelling too fast and not observing where they are going. If a motorist travels at the legal 60km/h and observes where he is going, the signs are visible enough to warn him of the circles, even at night. "Some of the signs are damaged and will be replaced with similar ones in the near future. They are, however, still visible to motorists." When Weekend Post visited the circles this week, they found them visible during the day, although several signs were missing, but difficult to see at night. Approaching the first circle at the Willow/Omar Cassem intersection at night (from the William Moffett Expressway side), warning signs on the left-hand side of the road were visible under the single row of street lights on that side of the road and one reflective arrow sign in front of the circle could be clearly seen. However, at the second circle at the Willow/Frank Landman intersection, warning signs were also visible, but the reflective arrow sign in front of the circle had been knocked down, making the circle impossible to see until your car was almost upon it. Approaching the same circle from the other side, the warning signs - now on the side of the street without lights - were difficult to see and the circle, with no reflective arrow sign on that side either, was again well hidden. The other circle was also less visible, as the reflective arrow sign on that side has been bumped and faced away from oncoming cars. Several readers have complained to Weekend Post's sister paper The Herald, with one reader referring to the circle at the Willow/Frank Landman inter-section as looking "like a war zone". REGARDING the article "Traffic circles hindering instead of helping" (Weekend Post, May 13), I am the person who made the comment quoted in the article's last paragraph, that the intersection looks "like a war zone". I would like to add the' following. Willow Road and the "little circles" are in effect a microcosm of three much larger issues in our metro: rapidly growing traffic congestion and no visible plans to address this, negative traffic planning features, and lack of proper maintenance. Regarding my first point, the present Willow Road was upgraded as part of the future Fairview infrastructure. It was planned as a residential road to serve the future local community. In this context the circles were put there, mainly to regulate but also to calm traffic. What was not allowed for was that the old Willow Road had in the meantime, since the apartheid government's ill-fated resettlement programme in the 1970s, become a main thoroughfare carrying thousands of cars daily, because the	. surrounding main roads had become too busy. All this through-traffic has no business in Fairview and simply drives through it for convenience. After the area is resettled at some time in the near future, and local traffic is added, this area will become a lot worse. Are there any plans to resolve this? Regarding my second point, most vehicles on this 3km-long road travel between 60km/h.and 80km/h (slower during peak hours). The two 20km/h circles became a hazard because traffic does not need to be calmed suddenly in the middle of a road like that and drivers do not expect it. The consequence was well described in your article in terms, of vehicles that have struck the island. I would like to reiterate that hazardous features are being built into our roads to calm traffic, and that cars are beiag damaged in these places, contributing to some of the horrible accidents we read about. The authorities appear to be unaware of or unconcerned about this, by simply sitting back and pointing fingers at allegedly errant motorists. Thirdly, no-one from the metro appears even to have visited the area to replace the warning signs, which have been down for months. Also, the one street light that would otherwise light the island in the absence of warning signs, has been dead for months. If the metro can't deal with that, how will it deal with the two bigger issues described in this letter? I REFER to an article in your newspaper of May 13 (Traffic circles hindering instead of helping"). It must be understood that traffic circles serve a dual purpose: They act as a calming agent and also help to regulate the free flow of traffic. The challenge that we face as stake holders (traffic authorities, driving school instructors, the media, etc) is to educate motorists to approach traffic circles in an alert and cautious manner. Motorists should be encouraged to pay attention to traffic signs/markings. Due consideration and proper planning are undertaken before any decision to put up traffic calming measures is made, therefore to suggest that any traffic circle is a hindrance to traffic flow is rather unfortunate. We urge all motorists to promote road safety and proper road usage by obeying the rules of the road at all times. I refer to the statement by Mr Njezula "Due consideration and proper planning are undertaken before any decision to put up traffic calming measures is made, therefore to suggest that any traffic circle is a hindrance to traffic flow is rather unfortunate"
My concern is that the Metro appears to be in a state of denial re the massive rate of growth in traffic volume that is taking place. Everywhere one sees property development, and new vehicle sales are on an all time high, but there is no evidence of a bold plan to deal with the increasing traffic flow this is generating. Instead there are elements of negative traffic planning, like encroachment into road reserves, no distinction between local and through traffic and this heavy emphasis on traffic calming. Hence a vital arterial link road like William Moffat Expressway, sees a proliferation of traffic signals, business sites reaching to the road edge and a ghost flyover bridge. A road like the celebrated Willow, a local road by design, has become a through road by default. Elsewhere in roads like Heugh, Buffelsfontein, Cape, Harrower, Stanford, you name it, similar problems exist, and no apparent near term answers. Where circles have been used some of them are not really doing the job hence the criticisms. So how can we deal with these issues. To start with, recognise that physical objects in the roads, no matter how we pontificate over them, have the terrible side effect of damage to vehicles and tyres that can later contribute to road accidents and fatalities. They are being used to police mainly a small percentage of reckless drivers, but punishing other innocents. I believe that in every road planning issue we should focus on the bigger picture, how to improve traffic flow, not slow it down, and if we must have calming measures, have infallible warnings, other than rely on signs which can go unnoticed in bad light. Then let's see if there is an overall traffic plan to address the needs of the city as it is developing. PIERRE Joubert's letter says it all. Traffic circles will work, but Willow Road's circles are badly marked and badly lit-up. Traffic spokesman L Njezula says himself: "Motorists should pay attention to traffic signs/markings." Fine, but then improve and maintain them! A motorist travelling normally in front of me at 7.30pm on Monday, slammed on brakes too late due to no signs. Unfortunately he was never taught to release brakes just before hitting a circle kerb, and burst a front tyre. A skidding wheel is not a "wheel" anymore - even no steering! A rolling wheel has a fair chance of climbing an average kerb without damage. Are there no reflective rubber poles available? Solution: Widen Willow Road and build Pine Road from Van Eck Road to spread the traffic load. Traffic planners - please read Pierre Joubert's letter at your next meeting! THE recent letters to your paper from PJoubert and others regarding the traffic and road issues in the municipality refer. How refreshing that these residents are prepared to take,up the cudgels and be interested in civic affairs. As many of the areas discussed in these letters fall into the ward I represent in council, I thought it appropriate to respond. I agree with Joubert's comment that only a small portion of our drivers are reckless. Speeding is a universal problem in the city. In my ward alone, many issues brought to me by residents are requests for speed humps or traffic-calming measures in the ward. As far as foresight into the future of our road network is concerned, there are plans afoot to rectify the situation. The widening of Heugh Road and Buffelsfontein Road as well as the upgrading of the William Moffett Expressway are all on tbe budget for the next few years. The upgrading, of Glenhurd Drive and the construction of a link road from Fairview to link with Alan Drive is planned over the next few years. These are just some of the budgeted projects for our municipality to alleviate traffic congestion over the next few years.